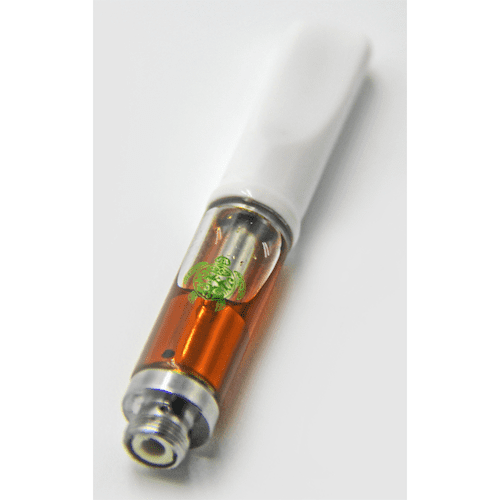 500mg Cartridge cut only with terpenes. You won’t find a better value on the market today. 500mg of CO2 oil cut only with terpenes. The most reliable cartridge on the market (see our FAQs for why)! We extract cannabis terpenes ourselves from every strain we process. Because we extract them under cool temperatures within the first 30 minutes of extraction, these highly volatile compounds remain in their most unadulterated state. They aren’t clear and aren’t supposed to be clear, and they smell and taste AMAZING. Our process includes a triple winterization to remove the bad tasting plant waxes, lipids, and chlorophyll leaving behind only those compounds you want to inhale. Our oils are different. We had a distillation unit and got rid of it. The limited THC high just wasn’t what we wanted for Lucky Tutle which is honest, pure, cannabis oil as close to the original plant as possible, the way it was intended. There are hundreds of cannabinoids and other plant compounds we as a population simply don’t understand. What we do understand is these compounds, namely cannabinoids, terpenes and flavinols, work synergistically together to give you the best possible medical benefit and full-body high lost in distillates. We are trying to break the marketing falsehood…clearer is not better. Visited CO and tried at least 10 different cartridge brands. Lucky Turtle was hands down the best. Wish you all sold your product closer to Brek/Keystone! As i’ve gotten older, have kids, can’t always sneak out and blaze like the days of old. These cartridges are some of the best for the price around! i’ve tried every vape cartridge, disposable, FSE, etc.. i absolutely swear by these. grab a few if you get the chance! solid high! great job turtles! Thanks for the love, Robert! 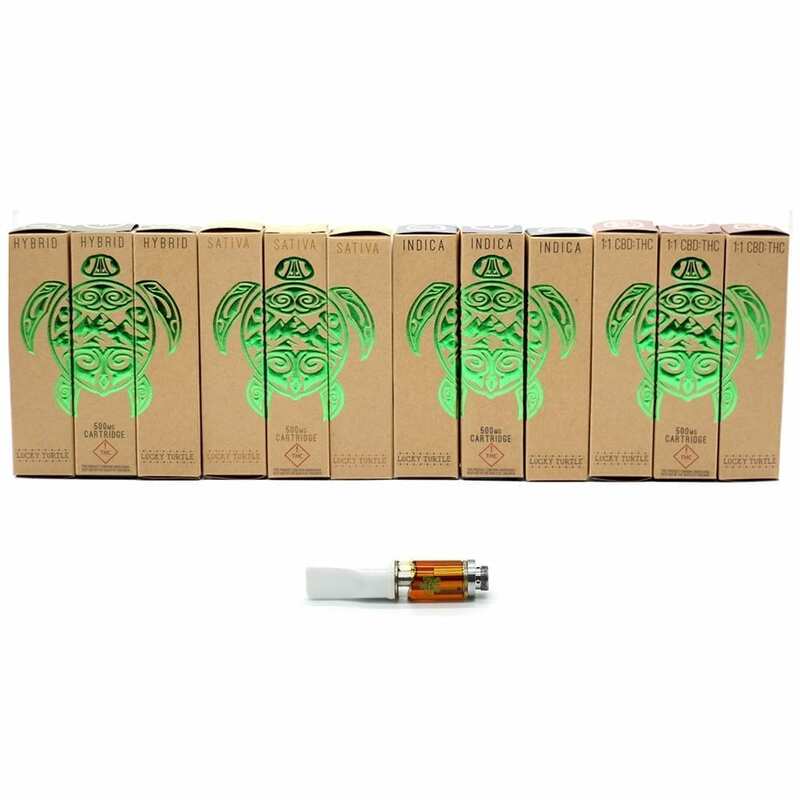 Lucky Turtle has become my one and ONLY choice for cartridges. 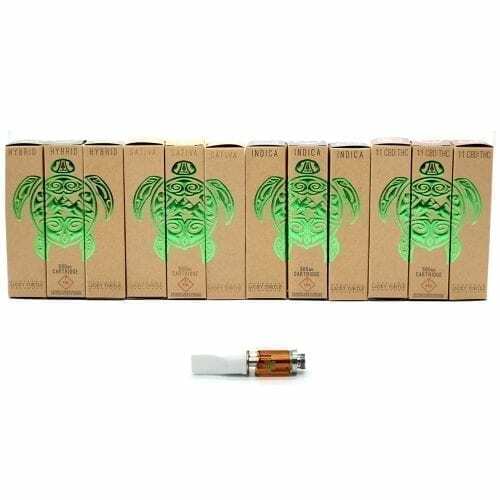 I’ve tried a good share of the main brand names like o.pen, the clear, nectar bee, and none of them are as amazing as Lucky Turtle!!! Full plant concentrates, CO2 extraction, no distilling and cutting the product down, just pure, clean, and effective medicine!!! Visited Colorado as a tourist and bought the very reasonably priced starter pack: pen, cartridge and charger, and WOW what a product!!!! One hit at the mid level setting and that was all I needed, whoa…….. what a high………..what great product!!!!!! 5 stars all the way! This is the only cartridge I have used where you can actually smoke all of the oil! And it is some GREAT oil!! You can’t go wrong with any of the kinds! Thank you for making such a great and affordable product! Great taste, great feel, great product. Perfect purchase for the price-point. Anyone happen to know what ohms these cartridges are supposed to fire at? Smooth full flavor with a great body buzz. Best cartridge on the market, period. Flavor, potency and price. None are better. O-PEN and Nectar Bee can’t touch this product! Absolutely love these cartridges. I have had some issues with leaking, but after I clean the cartridge and the pen they continue to work. Flavor and potency is on point! I highly recommend them to all of my friends. Bought a cartridge for first time n loved it. If oportunity strikes to buy another i would without hesitation. EDITED FROM LAST TIME: 2 of the cartridges worked on different pens and I have sense purchased many more. I recommend it to all of my friends. LOVE this product! Adding another review. After reaching out with an issue with leaking, they reached out quickly and replaced the faulty cartridge. Great service combined with great taste make this a winner. Bought a Lucky Turtle Bruce Banner cartridge yesterdycand must say it is fantastic. 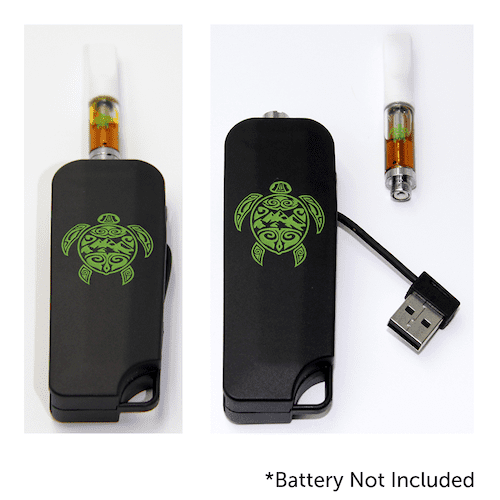 Lucky Turtle uses the finish method of extracting to provide you with fill plant wholeness in the oil. I have never tasted a cleaner vape. Bought the Gorilla Glue and smoked the whole damn thing over a weekend. Went to the very end without any hardware problems (which is rare anymore). I’ve tried every cartridge in Colorado over the last 5 years, PAT, Pax, Evolab, C3, O.pen, indigo, craft, and I have to say this was better than all of them. Nice work you guys! You landed a long-term customer. Anxiously awaiting more Haole cartridges. Please hurry. I wish I could give more stars – when they work they are amazing, but when you purchase 11 cartridges and 3 of them DO NOT WORK – its a big bummer. Wasted close to $100….emailed the company and will update once they reply. Hi Heather. Really sorry for any trouble you may have had. We didn’t receive an email but we will always replace any faulty hardware. Please email us if your issue hasn’t been resolved at the store level. Tried to send you an email at the address you supplied with your comment. Gorilla Glue with CO2 terps…where can I get more of these?!!!!! Sooooo happy I stumbled on this a few days ago. Best cartridge I’ve ever had. High was fantastic and made for a great Friday night listening to a dead cover band! No PEG? And this price? Just had the Haole and it’s amazing! I don’t normally write reviews but it’s THAT good. Delicious! Smoked this thing forever, just kept going. Tastes really good with no chemically bad after taste. It’s very effective as well.. I definitely needed fewer hits to get to where I liked to be at compared to other cartridges I have tried. Use for refilling vapes, dabbing, or adding to your homemade edibles. 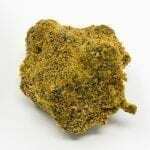 Offered in various Sativa, Hybrid, Indica, and 1:1 strains. Nothing but clean CO2 oil and terpenes. 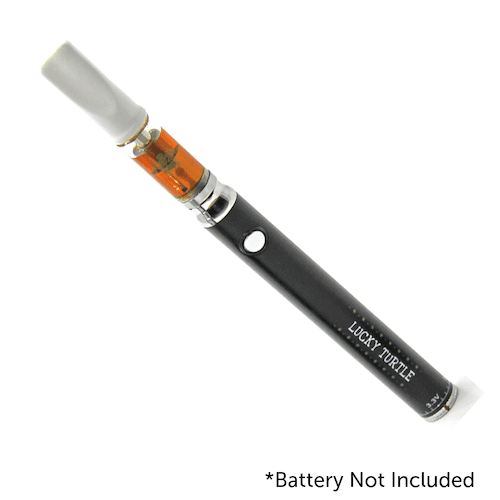 500mg adjustable air flow vape cartridge cut only with our TrueTerps Cannabis Terpene Blend. Smooth full hit, great taste, and no leaks! Copyright © 2018 Lucky Turtle. All rights reserved.